The DropCatch auction for NJD.com, the youngest three letter .com domain name on the planet, has ended. A bit of a background story. Originally registered in 1997 by a Japanese registrant, NJD.com dropped, all thanks to some undeliverable email, after a Japanese ISP changed its internal services. 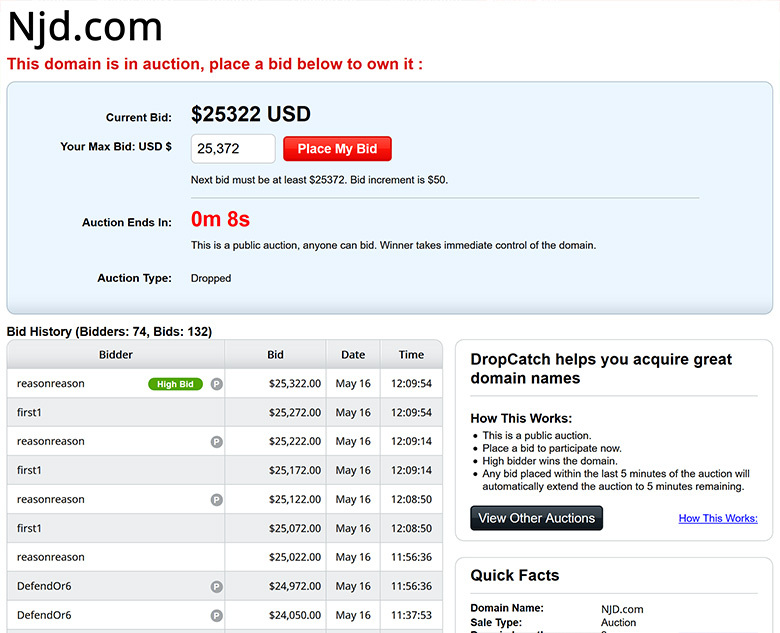 The domain was caught by DropCatch, and 74 bidders placed 132 bids in total. The final bid was at $25,322 dollars, a bit underwhelming, as we were projecting a sale above $30k. A similar auction at DropCatch ended a little higher, last week. Congratulations to the new owner, with the account “reasonreason” at DropCatch.